Why Every Girl Needs Ghee for some Intense Hair Care! We are bombarded with numerous hair care products on a daily basis practically. From shampoos, conditioners to serums, there are plenty of brands that keep coming out with newer products claiming that they’re great for our hair. And we’re ready to experiment because after all, who doesn’t love a good hair day? We’re sure you want gorgeous and shiny tresses for every party and occasion. And what if we told you that these tresses are just a step away - with ghee for hair! Yes! Ghee, or clarified butter, is an amazing ingredient to use on your hair! This Indian household staple has more than one use. We have always heard about multiple uses of ghee in food and even for our skin. But not many know that ghee is a great product for our hair too. 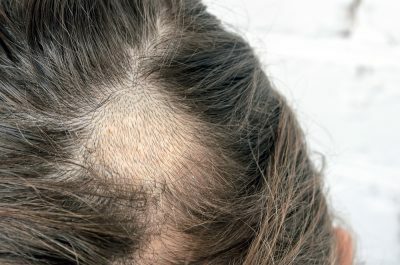 It has vitamin A that keeps the hair healthy and Vitamin D that helps fight hair loss. Not only that, but Ghee also has fatty acids that can help the quality of your hair from the inside out. Here are some ways you can use ghee on your hair not just for a good hair day but a good hair life! Read on to know how to pamper your hair with Ghee. There are many ghee benefits for hair. It is considered to be an excellent conditioner, much better than the store-bought varieties. It has no added chemicals that make your hair rough and cause damage to the scalp. You can make your own conditioner at home by mixing two tablespoons of ghee with one tablespoon of olive oil. Start using it after every wash to see softer and smoother hair! Tears and tangles in your hair are so annoying. But apart from being annoying, they’re actually harmful! Also, let’s not forget how much they hurt when you try to comb tangled hair. 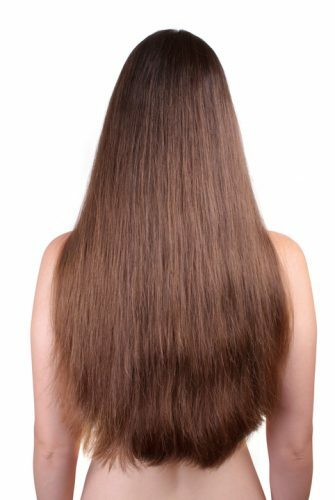 Tangled hair is more prone to breakage and thinning. Fortunately, ghee for your hair can help you look occasion-ready. Simply use a bit on your hair after washing it, to detangle and smoothen it. Say hello to more manageable hair! Massaging your scalp and hair with ghee is another way you can use it to get frizz-free tresses. A massage is also super relaxing - something that will definitely help you through all kinds of stress, be it the pressure of deadlines or of looking good for a party. Massaging the scalp can be very liberating and helps calm your senses. But more importantly, it increases blood circulation which helps maintain the health of your hair. Mix equal parts ghee and coconut oil and use it to massage your hair. It’s more nourishing than using just oil. We are no strangers to white woes. 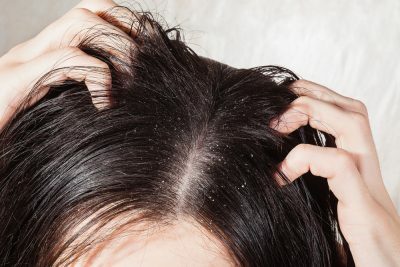 Dandruff can be a pest to deal with, and frankly, also a little embarrassing. 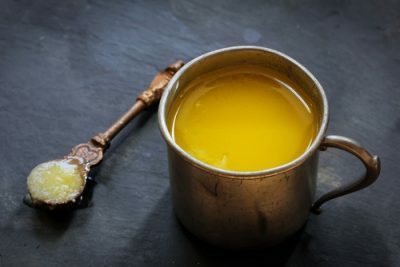 Ghee benefits for hair, however, can make sure that dandruff is not something you have to worry about on significant days like a presentation in front of your bosses or a party. Massage your scalp with lukewarm ghee and almond oil and wash it off with rose water. Do this twice a month to see a remarkable difference in your scalp. No one wants split ends. They make your hair thin and more brittle. Well, ghee is a godsend for preventing split ends. 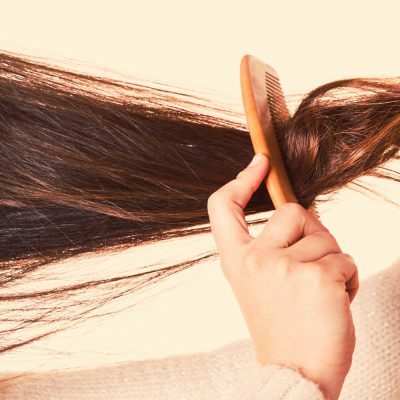 Simply take a little bit of desi ghee for your hair and use a wide-toothed comb to spread it through your split ends. Let it stay for 10 to 15 minutes before washing it off with a mild shampoo. Another benefit of ghee for hair is that it adds that extra shine to your hair just like how highlighter works for your skin. If you are someone who wants soft and shiny hair in time for any occasion, use it on your hair for that extra bounce and shine. Just heat some ghee up and apply on your hair. Let it sit for 20 minutes before you rinse your hair with warm water. The results are great. We’re sure you’ll love it! Want strong locks that don’t break every time you use a hair dryer or straightening iron? Use ghee on your hair. Two or three times a month, apply ghee on your hair and let it stay overnight. Wash it off the next morning with onion juice. It may sound like a smelly process, but it’s definitely worth the effort. Ghee can be treated as a hair oil to grow your hair longer. It nourishes your scalp and stimulates hair growth making your hair longer and stronger. All you need to do is massage your scalp with some hot ghee and let it stay for about 20 minutes before you rinse your hair. Then use a mild shampoo to wash your hair. For faster results, you can mix coconut oil with ghee. Once you have longer hair, you can experiment with all kinds of hairstyles. Braid the long tresses, make a bun or even get them coloured. Style your long hair however you wish to. You don’t want those pesky white flakes to spoil that lovely little black dress of yours, do you? To get rid of the constant itching on your scalp, ghee works as a great home remedy. The vitamins and minerals in ghee help prevent the itchiness. Mix ghee with lemon juice, apply it on the scalp and massage for some time before rinsing off. For dry hair, mix hot ghee and almond oil and massage it into your scalp and lengths of your hair. After 15 minutes, rinse off with rose water to remove the oil from the hair. Wash your hair with a mild shampoo and repeat this exercise about twice the week. You’ll be surprised to see the results. Apart from making your hair strong, shiny and long, ghee works as a great medicine in case you have a scalp infection. Ghee being a dairy product, helps to kill the bacteria that cause scalp infections. 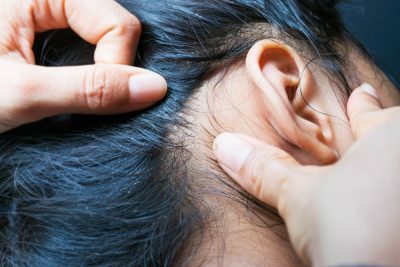 If you have white spots on your scalp, massage the scalp with hot ghee twice a week to help get rid of scalp infections. They say grey hair is a sign of wisdom but we all know that premature greying of hair can be nothing but really annoying and embarrassing. In case you have some unwanted grey strands, don’t cut them off, this will only make them multiply. Use ghee on your hair to get rid of the greys. Apply hot ghee on hair like you apply hair oil. Wrap your hair in a towel for 15 minutes and then rinse off with a mild shampoo. You’ll see the results in no time. We use styling products on our hair all the time hoping that it will make our hair texture better. Unfortunately, serums and sprays only tame the hair temporarily. For a better and more effective solution, apply ghee directly onto the hair and scalp. It can improve the texture by endowing the hair with extra smoothness and shine. All you have to do is heat a spoonful of ghee to melt it slightly. Dip your fingers into it and rub gently on your scalp and hair. Let it sit for a few hours and wash with shampoo. Just like our skin, our hair also loses moisture if we don’t keep it hydrated enough. Lack of moisture makes our hair dull and dry. To have a rich scalp, you must apply ghee. The healthy and rich fatty acids found in ghee nourish the scalp and hair follicles from within to give a boost of hydration, restoring the hair’s health. It is extremely moisturizing and helps combat dry hair, leaving your mane very soft and moisturized. Untimely baldness or bald patches on the scalp spoil the whole look, don’t they? How our hair looks contributes a lot to our overall appearance. Drink milk mixed with ghee and turmeric powder for hair repair and to gradually cure bald patches on your scalp. Take some Ghee, aloe vera gel, coconut oil and lemon. Mix equal quantities of melted ghee and coconut oil in a bowl. Now add one spoon lemon juice and one spoon of aloe vera gel in this mixture to make a smooth paste. Apply this pack on your scalp and let it sit for about 20 minutes. 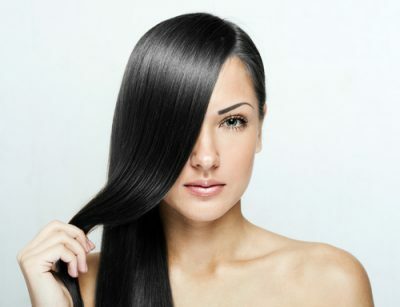 Rinse your hair with lukewarm water and avoid using a hair conditioner. Take some hot ghee and add two egg yolks to it. Stir the mixture well and apply it on your hair. Once you rinse your hair with water, you’ll see how this mask has left you with naturally straight hair without all the chemicals that come in many straightening products. POPxo is now available in six languages: English, Hindi, Tamil, Telugu, Marathi and Bangla. AWESOME NEWS! POPxo SHOP is now Open! Get 25% off on all the super fun mugs, phone covers, cushions, laptop sleeves, and more! Use coupon code POPXOFIRST. Online shopping for women never looked better!